A tiny little hand, a photo by PhotoPuddle on Flickr. I don't think I have posted this photo here before but even if I have it's the kind of photo that can be shared lots of times and still get a smile. The reason I am posting this is because we were in Kiddiecare today (a big shop full of things for babies and toddlers in case anyone doesn't know what I'm on about). We had a lovely time. We had lunch, the kids played and I got some nice clothes for them. However it did make me feel a little sad. Looking round the shop I realised that we don't really have much need to be in there any more. My daughter is a grown up school girl and my son is hurtling towards two years old. Whilst I definitely think our family is complete now and there are no plans for more babies it's kind of a weird feeling knowing that the baby years are over now. But I got over it pretty quickly when I thought of all the fun we can have as a family of four in the future. 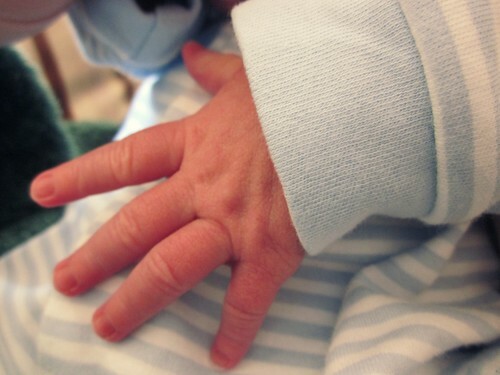 By the way, just in case you didn't realise this is a photo of my son'a newborn hand. Aren't hands this small just the cutest thing ever?